An alleged former THQ employee has written a pull-no-punches letter to the company's Board of Directors, blaming "chronic and constant mismanagement" for its current dire straits. 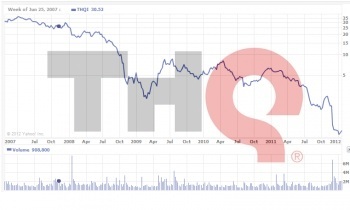 At one point in 2007, THQ shares were trading at over $35. Today, they are worth about 75 cents. It's nothing short of a slow-motion debacle, punctuated by studio closures, launch flops, missed financial targets and a recent warning from Michael Pachter that the company is at risk of running out of cash by the June 2012 quarter. What happened? Opinions are easy, but the words of an alleged ex-THQ employee [or possibly more than one] going by the name "The Formerly Mismanaged" would seem to carry more weight than most. An open letter sent to THQ's board and various media outlets places the blame squarely on CEO Brian Farrell and various other executives who draw hefty salaries while flailing around in a fugue of incompetence. "THQ had been known through the years for having a formula," the letter says. "They find a hot license, make a cheap game, barely advertise it, and make money. This formula worked during the Playstation and Xbox and Gameboy days and made the company a lot of cash. Unfortunately, THQ's old guard executives seem to be stuck trying to manage the company the same way they did back then and haven't realized the industry has changed." The "beginning of the end" came when Farrell and his executive team began snapping up studios without any real strategic plan for them. After sinking big bucks into the acquisitions, more money was wasted as they failed and were closed down. Meanwhile, as the "kids, family [and] casual" game business began to rapidly cool, THQ bulled ahead, overpaying for brand licenses that nobody was interested in. And then there was the uDraw. "The fact is that the CEO and executive committee were so focused on trying to hit an unrealistic financial goal that they bet everything on an extremely risky proposition in the uDraw tablet. When they lost, they further displayed their lack of management skills by not having a contingency plan," it continues. "Three weeks after the game launched, an entire business unit was wiped out when it didn't meet its goal due to relying on that one product to hit an unrealistic target." "Brian Farrell, CEO with a 2011 salary of $1,289,558, for a lack of business intelligence or fiscal accountability." "Martin Good, EVP and head of Kids, Family, Casual with a 2011 salary of $1,198,023, for bringing no strategic thought or business sense to the role." "Paul Pucino, CFO with a 2011 salary of $674,855, for not planning for this possibility and having a safety net or a plan to cover THQ just in case of failure." "Ian Curran, EVP and head of global publishing with a 2011 salary of $1,037,047, for not flagging an unrealistic sales goal to the CEO or the Board when a big part of the corporation felt the numbers were unrealistic." "Ed Kauffman, EVP of Legal and Business Affairs who clearly was signing bad deals on licensed products, not factoring in the changes in the business and being more critical with financial terms with partners." "This Board has allowed the Brian Farrell, the CEO, the ongoing ability to take a cash-rich profitable company and drive it from a $30 share price down to around $.70 without acting despite numerous mistakes that even for those lacking business training, could see were errors," the letter states. "Even without glaring mistakes how can the same CEO stay in charge after a 99 percent share price loss?" Whether or not the letter actually comes from a former THQ staffer, that's a pretty valid question. Companies tank, that's a fact of life, but it's also a fact that when they do, heads must roll. When a company slides from 35 dollars to 75 cents, it's hard not to see that as time for the CEO to go on the block. "Formerly Mismanaged's" full letter is actually quite lengthy and goes into significant detail in its complaints, and makes a schadenfreudistcally fun read for anyone with an interest in the ugly side of the business side of the videogame industry. If that's your cup of sorrow, you can catch the whole thing at Joystiq.